Here’s a recipe that results in a succulent, melt-in-your-mouth pork loin, just in time for this cold weather and friends. By keeping the temperature at 185º F and making sure the smoke does not turn densely white, the smoke flavor is subtle, sweet. 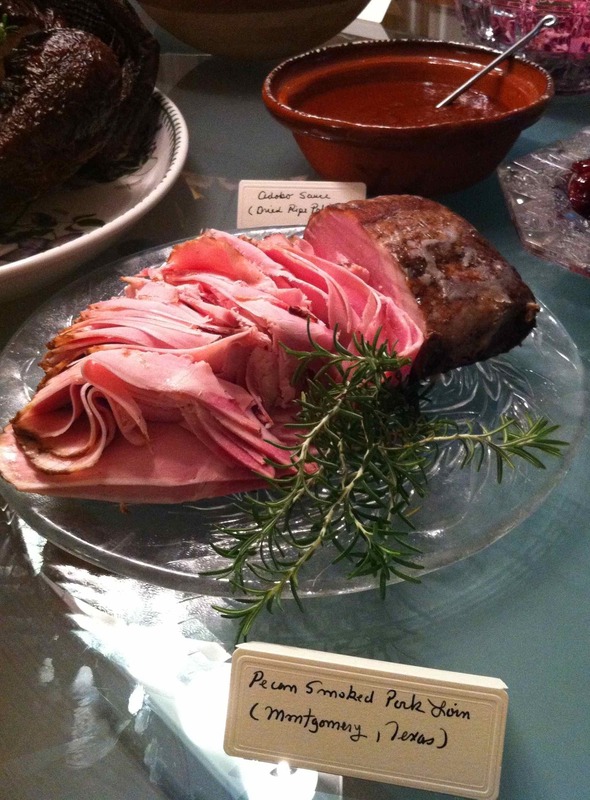 I’m feeling giddy since I served it, so I’ll paraphrase a line from the movie, Who’s Killing the Great Chefs of Europe: “ever-new arising vistas of harmonizing flavors!”ok, slap back to real. 1 ounce TCM (tinted curing mixture) Note: Being aware of the pros and cons of nitrates and nitrites in TCM, I think a moderate use is prudent and good. You may omit the TCM and your smoked meat will turn out fine. 1. Add the sugar, salt and TCM to the water and stir until completely dissolved. 2. Add the ice to cool the brine. 3. Cut off excess fat and weigh the pork loins. Inject them with an amount of brine that equals 10% of their weight. Injected brine for a 3 lb pork loin would be thus: 3 lb loin X 16 ounces = 48 ounces. 4. Place them in a stainless steel or plastic container and completely cover them with the brine. Top them with a heavy dish to keep them submerged. 5. After three days of brining, remove them, rinse with fresh water and pat them dry. 6. Air dry them to form a pellicle according to the method that we used for the Thanksgiving turkey. 7. Then smoke the pork in Pecan wood, also according to the method used for the Thanksgiving turkey. 8. Smoke for 4-6 hours or until the internal temperature is 155º F.
When I served it at the buffet table, the slices were ultra thin, as you can see. This makes for a beautiful presentation but also adds to the melt-in-your-mouth texture. Ackowledgement is due the CIA for their strong chef training programs. 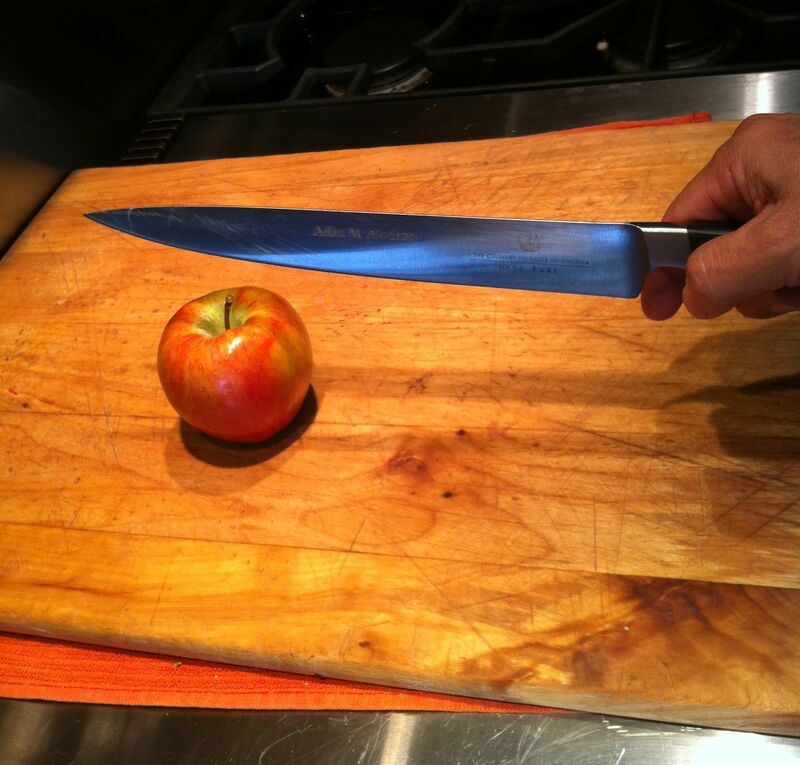 When I was at the CIA our class of 18 culinary students was drilled for 3 weeks in “precision knife skills.” It takes a lot of practice, and you use a very long slicing knife that is razor sharp. 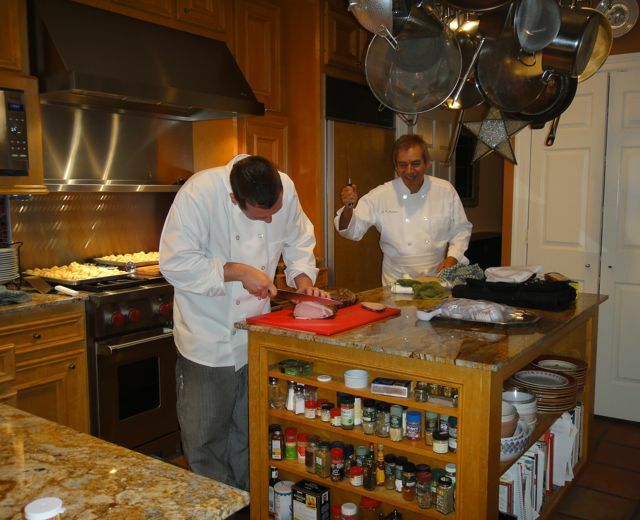 Here I am encouraging Chef Kevin Babbitt to cut the pork wafer-thin and with precision! Bon Appétit.